Papa Doc's Haiti -- A Paradise Lost. "Our Doc, who art in the Palais National for life, hallowed be Thy name by present and future generations. Thy will be done in Port-au-Prince as it is in the provinces. Give us this day our new Haiti and forgive not the trespasses of those antipatriots who daily spit upon our country; lead them into temptation, and, poisoned by their own venom, deliver them from no evil. Amen." 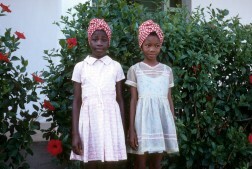 Written in Blood: The Story of the Haitian People 1492-1971. Feb. 25, 1979, Louisville Courier-Journal.